Apple today announced an all-new iMac model, called the "iMac Pro," with an expected launch date this December and starting at $4,999. The company called the computer "the most powerful Mac ever" and it's been designed specifically for pro-level users with demanding workflows. 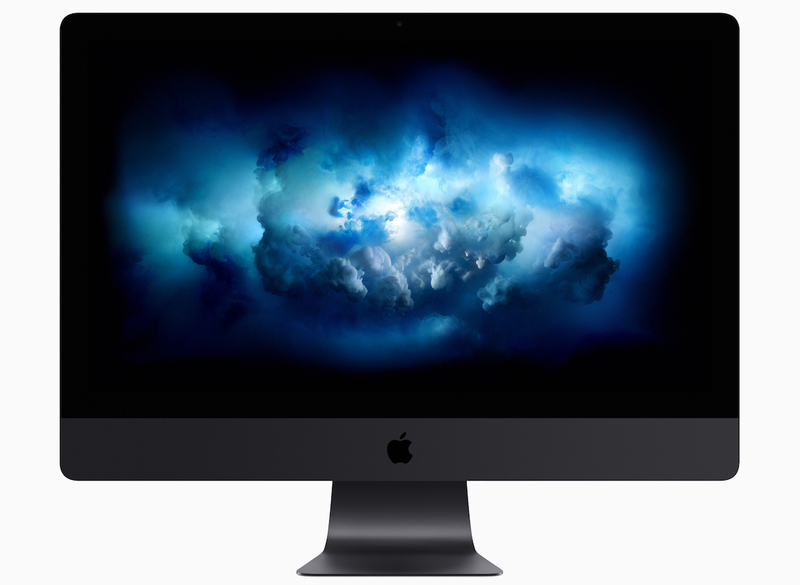 The 27-inch iMac Pro includes a Retina 5K display, up to 18-core Xeon processors, and up to 22 Teraflops of graphics computation achievable on the high-end configurations. The iMac Pro also marks the first time than a desktop Mac will come in Space Gray, including the iMac Pro's Magic Keyboard, Magic Trackpad 2, and Magic Mouse. Apple said that with the powerful desktop, users will be able to take advantage of advanced graphics editing, virtual reality content creation, and real-time 3D model rendering. The iMac Pro includes an all-flash architecture and new thermal design, allowing the desktop Mac to deliver up to 80 percent more cooling capacity than current iMacs, but in the same iMac design. The iMac Pro comes with the new Radeon Pro Vega GPU, the most advanced graphics ever in a Mac, and features up to 16GB of on-package high-bandwidth memory. With the new power, iMac Pro can deliver up to 11 Teraflops of single-precision compute power, powering the computer's real-time 3D rendering and VR abilities. In terms of storage, iMac Pro supports up to 4TB of SSD and up to 128GB of ECC memory. Thanks to four Thunderbolt 3 ports, users can also connect up to two high-performance RAID arrays and two 5K displays at the same time, further beefing up their pro-level workstations. For the first time on a Mac, the new iMac Pro features 10Gb Ethernet for up to 10 times faster networking speeds. In addition to the iMac Pro announcement, Apple kept the pro-level reveals coming today by stating that the company is working on "a completely redesigned, next-generation" Mac Pro that is being built for users who required the highest-end, high-throughput system performance. A new high-end pro-level display will also be coming sometime soon. The iMac Pro will be available in December, with a price starting at $4,999. Those interested can discover more details about the new computer on Apple's website. Placed my order already. Looking forward to it. You placed your order for something that's not available to order until December? Missed opportunity here...still not user-upgradable. The Mac Pro needed to be replaced by a proper workstation. Oh well...the hackintosh lives on! Bring the complaints about price from those that have no reasonable use for the power this thing offers. ... that someone actually cares about the bezels on a desktop. And yet the same tired bezel design from yesteryear. Courageous! And it will be - just not until next year. The iMac Pro will slot in below the 2018 Mac Pro. Can't believe they put out a five grand iMac and still can't update the Mac mini.